Audie Leon Murphy died in a private plane crash near Roanoke, Virginia, on May 28, 1971. He was almost 46 years old, but in that short time had led three lives—all remarkable—and the middle was spectacular. A sharecropper’s son, the seventh of 12 children, Murphy was born in Kingston, a dot on the map in North Texas, on June 20, 1925. His father, Emmett, had a knack for fathering children, but no talent for feeding them and wandered in and out of their lives, eventually deserting them. Murphy became a dependable rifle shot, hunting small game to feed the Murphy brood and his mother, Josie, whom he adored. He picked cotton for a dollar a day, pumped gas, worked as a store clerk, and managed to finish the 5th grade in country school, all the time dreaming for what every youngster in similar circumstances dreamed of—a new life somewhere else. The opportunity arose in December 1941, with Audie, then 16, soaking up war news and yearning to get into the fighting. His mother died of heart disease earlier that year, and since many of his brothers and sisters had been sent off to an orphanage, there was nothing except his age holding him back. He tried the Marines first—too young and too scrawny, the Corps said. The Navy and Army rendered similar verdicts. With no birth record to go by, his baby face and smallish stature told recruiters he was underage. Six months passed before an older sister came to his rescue and signed an affidavit, which added a year to Audie’s life. He became an Army private on June 30, 1942, took basic infantry training at Camp Wolters, Texas, and was assigned to the 15th Regiment, 3rd Infantry Division, then in North Africa. In 1943, he first saw combat in Italy at Salerno and later Anzio in early 1944. He earned his first promotion in rank and first decorations for gallantry as the Allied forces fought their way to Rome. 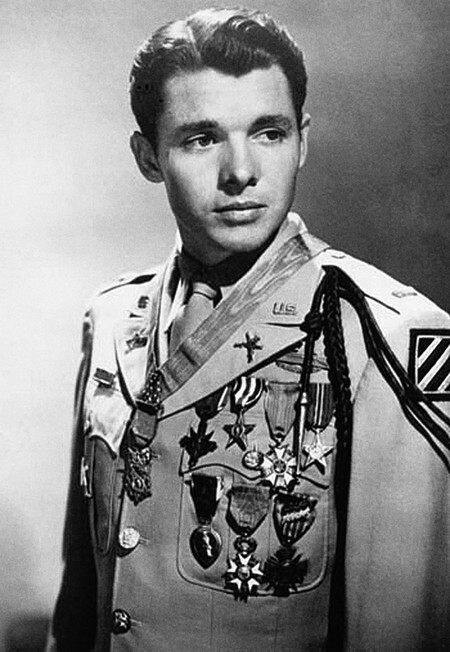 Through eight campaigns in Sicily, Italy, France and Germany, World War II legend Audie Murphy earned 33 medals and citations including every award his country bestows for valor in the face of the enemy. In the summer of 1944, his unit was withdrawn from Italy to take part in Operation Anvil, later called Dragoon, the invasion of southern France following the D­-Day landings at Normandy. After nearly two months of incessant combat and heavy casualties in the fights near Marseilles, he received a battlefield promotion to second lieutenant. Murphy’s Army career drew to an astonishing close on January 26, 1945, in the Vosges Mountains in eastern France, when he earned the country’s highest award for valor. The Allies called the place the Colmar Pocket and it had been held by German troops for two months when Murphy reached it with the 3rd ID late in December 1944. In January, with its snowy weather and plummeting temperatures, the Americans met with a strong German counterattack near the village of Holtzwihr. Close to 250 German troops and six Panzer tanks emerged from the surrounding forest and directed fire at the American position as Murphy, now a 19­-year-­old company commander, manned the field telephone to call for reinforcements and artillery support. While he waited, the Germans scored a hit on an American M10 tank destroyer, igniting a fire and forcing its five-­man crew to abandon it. Murphy first ordered his company to positions in the woods to regroup, then mounted the turret of the burning M10 and began firing its .50-caliber Browning machine gun at the advancing German tanks and foot soldiers. He killed an estimated 50 enemy troops. He continued to operate the big Browning until it ran out of ammunition, even after sustaining a brutal shrapnel wound to his leg. The action stymied the German advance and earned Murphy the Medal of Honor, the culmination of a record of combat heroism unsurpassed in the annals of the Army. : the Distinguished Service Cross, two Silver Stars, two Bronze Stars, two Presidential Unit Citations, three Purple Hearts and the Medal of Honor. He would also earn the French Croix de Guerre twice. The first medal was presented with a silver star. The second was presented with palm three years later. He also received the Belgian Croix de Guerre with palm, and France’s prestigious Legion of Honor, Grade of Chevalier. He was discharged from the Army at Fort Sam Houston, Texas, on August 17, 1945. He was just 21. For the rest of his life, Murphy suffered from what became known as post­-traumatic stress disorder and was said to have recurring nightmares, sleeping with a pistol under his pillow. But his invisible wounds didn’t stop him from finding further success. He was briefly married to starlet Wanda Hendrix, and later remarried. He had two sons with his second wife. Murphy was buried with full military honors at Arlington National Cemetery, just across from the Memorial Amphitheater, on June 7, 1971. –Dale L. Walker of El Paso, Texas, is a past-president of Western Writers of America, Inc., and author of many historical books and biographies. World War II dispatches by legendary writer John Steinbeck capture the greatest entertainment mobilization the world has ever witnessed.